← Stop Diabesity In Its Tracks! I prematurely called an end to my crazy-making work schedule, it’s still nuts over there. Crazy hours make for crazy eating and I have went crazy for the last few days. No breakfast, carbs in my drinks, eating at restaurants for one or two meals a day. We have decided to quit eating out for the next week, we will see if it works out. It is difficult to plan, buy and cook food for two when you only have three hours an evening to do it. Yesterday, though we had a really good dinner that I would like to share with you. I have finally cooked enough dinner entrees that I can make adjustments to a recipe without fear, and that is what I did. 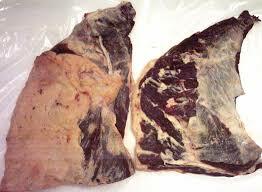 I bought a side of beef and went and picked it up the other day, and before I did I cleaned my deep freeze out. 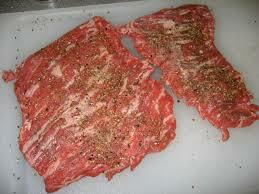 I have in my upstairs freezer now two flank steaks and four skirt steaks from the previous side of beef I bought. I brought it all upstairs so that we could use it up first, before the new beef. This steak has long muscle fibers, like the brisket, but it is very thin. Because it is thin you can cook it very quickly like you would any other steak. Like the brisket, the important thing about serving it is how you cut it at dinner time. You can’t see it really in this picture, but the muscle fibers run from top to bottom, basically along the length of the piece. To cut it across the grain you would cut it into very long strips. Unlike brisket, this piece of meat is very tender after just a little bit of cooking, which makes it ideal for using in a roulade. 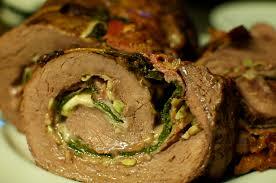 A roulade is what we had for dinner last night. To make a roulade you make a spicy or flavorful paste, spread it on one side of the meat just like you would butter bread. Then, starting at the pointy end, you roll the steak into a roll and either skewer it shut or tie it shut with butcher’s twine. 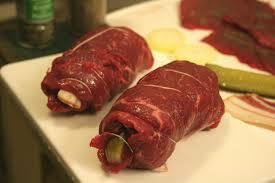 To cook it you sear the outside of the roll and then roast it or braise it for a half an hour. Yesterday I made a paste of diced onion, dijon mustard, bacon bits (home made), paprika, salt and pepper to spread on the meat. I seared it and then braised it in fresh bone broth that I had just made the day before. This dish is so good! You will always cut the meat in the right direction if you cook it this way, as to cut across the roll will always cut across the grain, too. You can cut it with a fork at the table once you have cut serving size pieces up for your guests. I had one skirt steak and it was long enough that I had to cut it in two and make two roulades with it. It looked something like this when I had rolled them and tied them. After they were braised for a half an hour I took them out of the braising liquid and reduced it down to almost gravy consistency, put a couple of table spoons of sour cream in it, and reduced it back down. After I cut the roulade I spooned this sauce over the meat just before I put it on the table. NUM! This entry was posted in Health, Living and tagged braising, flank steak, roulade, skirt steak. Bookmark the permalink. Oh my..I just had my protein shake…I want a stake!